After learning that the dead graphics card in my 2011 iMac would cost $700 to replace (! ), I needed a new Mac desktop system. I didn't want to end up in that situation again, so iMacs were out. I considered a "trash can" Mac Pro, but didn't like its cost or power utilization. Much has recently been written about the Mac Mini's three years without an upgrade. I reluctantly decided to buy one anyway, with 3GHz and an SSD. I'm glad I did! The SSD really makes it feel zippier than any desktop Mac I've previously owned. But the computer configuration I had really wanted all along was a tower, like older Mac Pros, and like the zareason Limbo 5880 Linux file server I've migrated most of my files to. So, I decided to assemble a Meta-Tower for my new Mac Mini, using a Mesh Stainless Steel Stackable Legal Size Letter Paper Tray Desktop Organizer. You may want to get one from The Container Store, as the ones on Amazon seem to have a tendency to arrive a little bent. The Meta-Tower co-locates the Mini with its peripherals and preserves some degree of physical access, without seriously obstructing waste heat dissipation. The same general idea, of course, could be applied to an Intel NUC, a Raspberry Pi, or any other compact, self-contained computer. The Mac Mini is snuggled on the bottom tier, alongside a router. The middle tier has an external hard drive ("HDD"), for Time Machine backups. The top tier has a USB 3.0 hub (which has proved to be largely unnecessary as recent Minis have a generous collection of USB ports.) It also hosts a couple of HDD docks, which I use for archiving astrophotography video. They let me swap HDD's in and out, almost as easily as Flash drives. I configured the devices so things I'd need to access (buttons & ports) faced forwards, or at least were near the open front. The Meta-Tower sides were partially obstructed, but not so much that it prevented me from threading cords through. 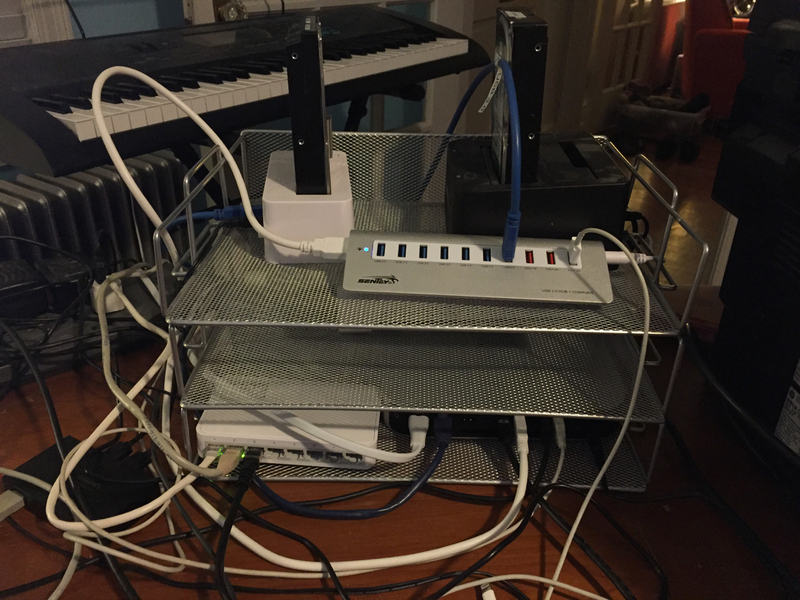 I expected I'd need to physically secure everything in place, but it turned out the cords were rigid enough to do that relatively well. Well-paired devices also braced one another. Where possible, I plugged power cables into a power strip on the floor beneath the desk. 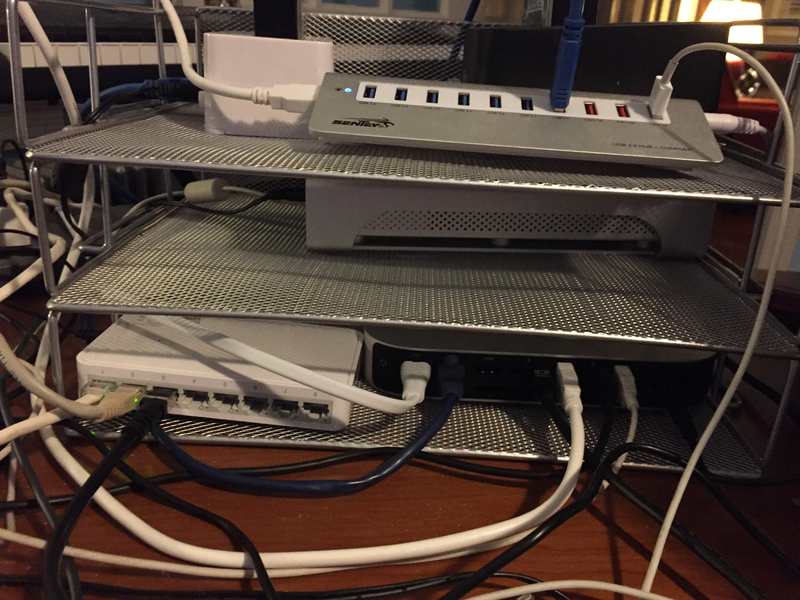 Devices that need to be plugged in and unplugged alot have a separate power strip atop my desk. I tried to use the shortest cords I could find. Lengths of 3 feet (91 cm) are definitely better than 6 feet (183 cm)! 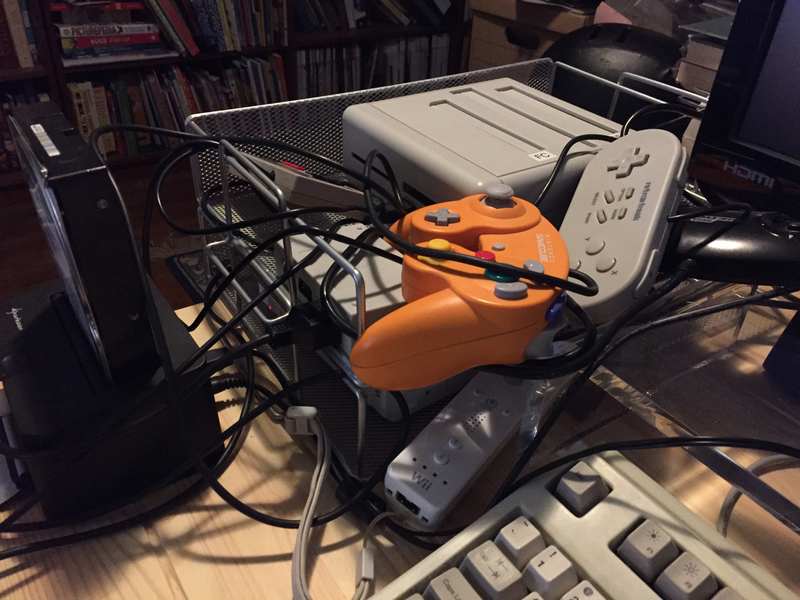 I built another Meta-Tower for my desktop game consoles. The bottom tier holds my Nintendo Wii. My Retro Freak needed to be on top, so I could continue plugging game cartridges into it from above and access its front-facing game control ports. The top tier also houses a classic controller adapter, which has additional ports. I've used a Brother labeler to distinguish some cartridge slots and cables, and an HDMI switcher to tie it all together. I'm not a laptop fan, but I have to use one for work. I reserved the third port on my HDMI switcher for it. The laptop itself won't fit in a desktop organizer, so instead it lives atop a Rain Design mStand Laptop Stand. Meta-Towers have some limitations. Unlike a real tower, the satellite devices don't all switch on and off in concert with their associated computer. As mentioned, it can be difficult or impossible to access devices that aren't on the topmost of a meta-tower. And of course there still are quite a few visible cords. But when all is said and done, Meta-Towers have reduced the amount of clutter on my desks. I also find them conceptually helpful, as organizational units. 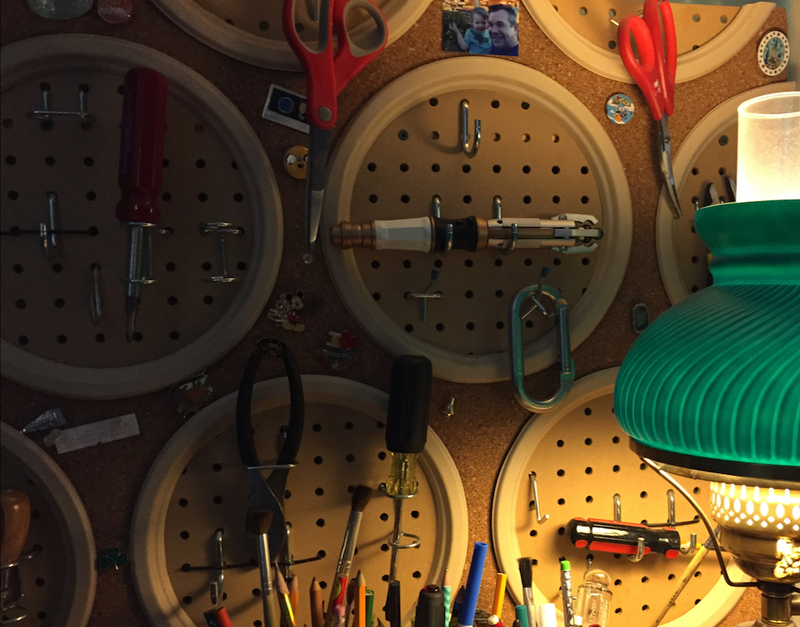 I'm happy to report that my TARDIS Roundel Combination Bulletin/Peg- board is still going strong! 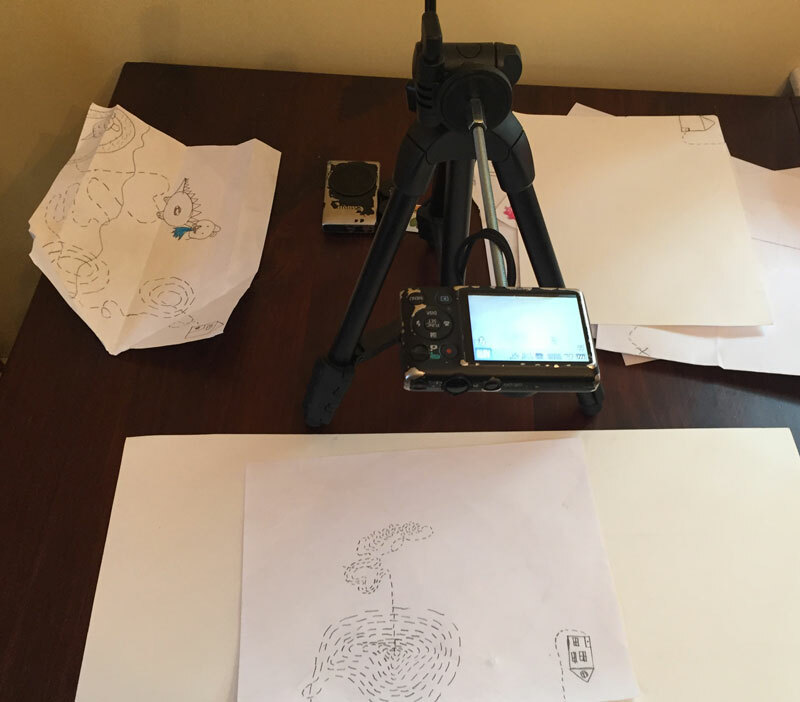 If you're a parent, you may also have struggled to keep up with all the artwork your child brings home. At first, I saved everything. But I quickly ran out of filing cabinets! I tried a scanner for a while. It produced good results, but took more than a minute of processing per document. Instead, I decided to set up an ad hoc scanning platform. I dusted off an old digital camera and got out my trusty Sony VCT-R100 Lightweight Compact Tripod. Then, I went to the hardware store and bought a 6-inch long 1/4"-20 headless bolt (also sometimes called a threaded rod) and a 1/4"-20 x W3/8" x L7/8" Coarse Thread Coupling Nut. I put the coupler over the screw on top of the tripod, where a camera would normally go. Once I'd installed the coupler, I screwed the headless bolt into it. Then I screwed the camera onto the bolt, using the camera's threaded mounting port. 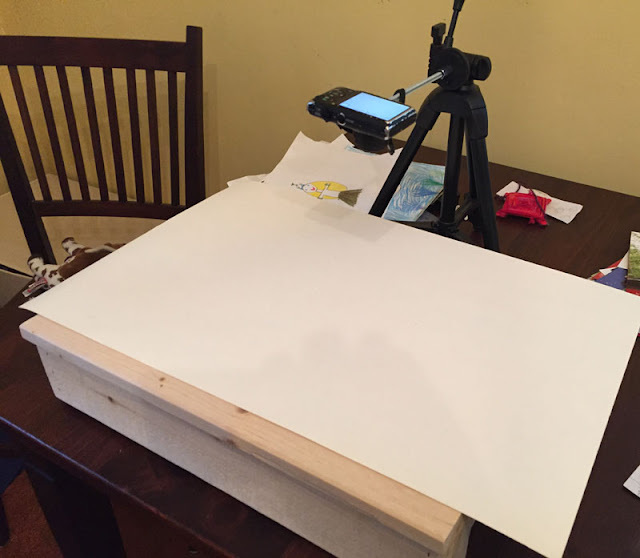 I put a large piece of white poster board down on a table, to serve as a neutral background, and set down the tripod and camera adjoining it. When the room I'm working in is poorly-lit, I supplement with an LED desk light. I cut down on output storage footprint by using JPEG image encoding, which is the default on most digital cameras. To save time and trouble, it helps to minimize the amount of necessary post-processing. When I photograph small items or items with lots of detail, I avoid the need to crop by brining them closer to my camera. To accomplish this, I built a raised platform out of wood slats. I swap it in and out as needed. Sometimes, post-processing is unavoidable. Although JPEG is a lossy image format, there are utilities to perform simple JPEG image transformations without additional information loss. On Windows, there's jpegcrop and JPEGCrops. On macOS, the Photos app performs lossy transformations, but always preserves the original file to apply them against, which reduces loss.